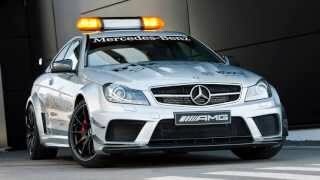 With the DTM (German Touring Car Masters) starting a few days ago, Mercedes has finally put their latest Safety Car for this season to use. Although the Mercedes Benz C63 AMG Coupe Black Series received lots of modifications to ensure it meets all the DTM requirements as a Safety Car, many features remain the same as the road-going C63 AMG Couple Black Series. Under its hood the DTM Safety Car is fitted with an AMG 6.3 liter V8 engine that delivers 517 horsepower and 457 lb-ft of torque. Interestingly enough, the Safety Car actually delivers 17 more horsepower than the AMG C-Coupe participating in the DTM, can go from 0 to 60 in 4.2 seconds and has an electronically limited top speed of 186 mph (300 km/h). 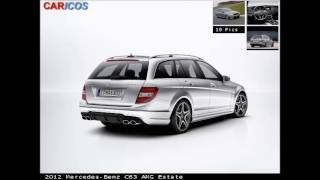 The V8 unit has been coupled with an AMG Speedshift MCT 7-speed, double clutch sports transmission with a RACE START system to guarantee fast gear shifting. Furthermore, although the Safety Car has been fitted with a modified AMG exhaust system, the power transmission, engine cooling system, the braking system, chassis and suspension are exactly the same as those found in the road-going AMG Black Series. According to Mercedes engineers, these areas "have been honed to perfection and did not require any modification". 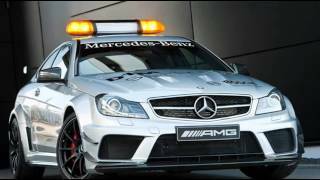 Nevertheless, the Safety Car has been packed with loads of AMG optional equipment such as the AMG Track package, AMG Exterior Carbon-Fiber package, AMG Aerodynamicspackage and a set of AMG light-alloy wheels. The AMG Aerodynamics package includes a carbon fiber front-splitter and a carbon fiber rear aerofoil with adjustable blade, whilst the AMG Exterior Carbon-Fiber package includes carbon fiber mirror housings, carbon fiber side still panels and carbon fiber diffuser. The interior has been only slightly modified and resemblances the production car to a high degree. The only notable changes brought to the interior of the Safety Car include a couple of AMG sport bucket seats, four-point seat belts and an AMG Performance steering wheel wrapped in nappa leather, featuring aluminum gearshift paddles and flattened top and bottom. 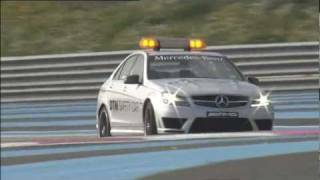 Obviously, the Safety Car has been equipped with other DTM specific equipment including a two-way radio system, a TV monitor, a rear camera for a better view of the cars following behind and stroboscope-type flashing LED lights. The German Touring Car Masters started on 29th of April and the Mercedes Benz C63 AMG Coupe Black Series will have to take turns in leading the pack with both Audi and BMW, alternating from race to race.